OTAKU CLUB: Chuunibyou demo Koi ga Shitai! I like to laugh. Who doesn't? I like to smile. A smile always brightens the day. I like to watch some high school kids pretending who they are not and cosplaying as characters like the Dark Flame Master. Oh, I guess this is the right place then because Chuunibyou demo Koi ga Shitai! can do all three of those things. Killing three birds with one stone, awesome isn't it? Chuunibyou demo Koi ga Shitai! (Regardless of My Adolescent Delusions of Grandeur, I Want a Date!) 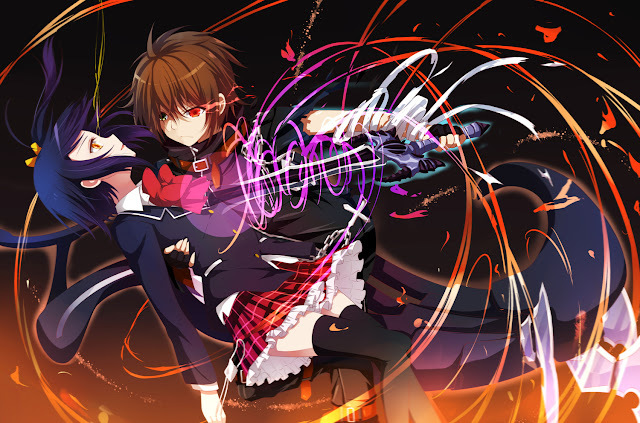 is an anime series based on the novel of the same name that is produced by Kyoto Animation. Some fans of Kyoto Ani (Clannad, Hyouka, Suzumiya Haruhi no Yuuutsu) will definitely rejoice because the Japanese studio is already well known for its rich visuals and aesthetics. They have been involved with many series with the typical high school life being turned from normal to abnormal and they did it once again! The series takes place at a typical high school setting. It involves a young boy named Yuuta Togashi who is suffering a case of...chuunibyou, or “Middle School 2nd Year Syndrome". In technical terms, it is a condition in which an individual deludes themselves as being a smartass and looks down on others. They also believe they have some sort of “special power” that excludes themselves from the normal society. It's actually quite common though. I don't know if you ever felt this way but a lot of people do weird things in high school. I mean, it's like how you used to believe yourself as a superhero like Batman or Superman when you were younger. Good days, good days. 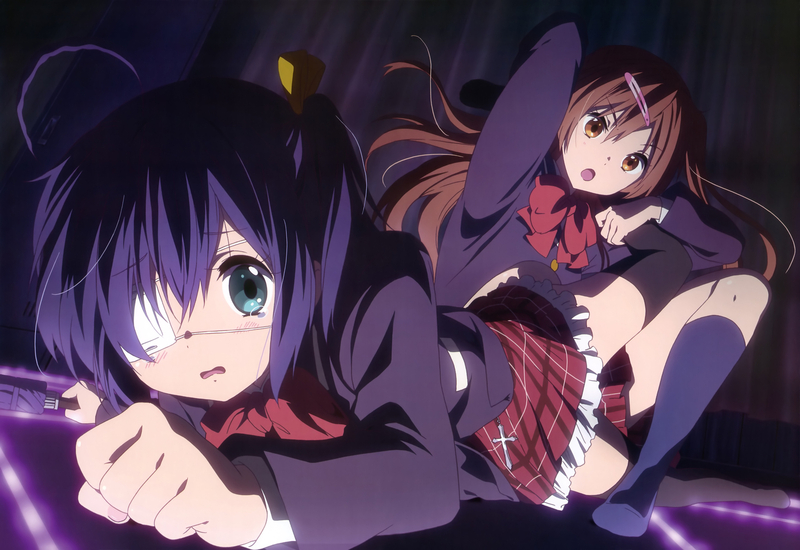 Rikka Takanashi – forget that eyepatch. This girl has that syndrome I'm talking about. She visions herself with the “wicked eye”. 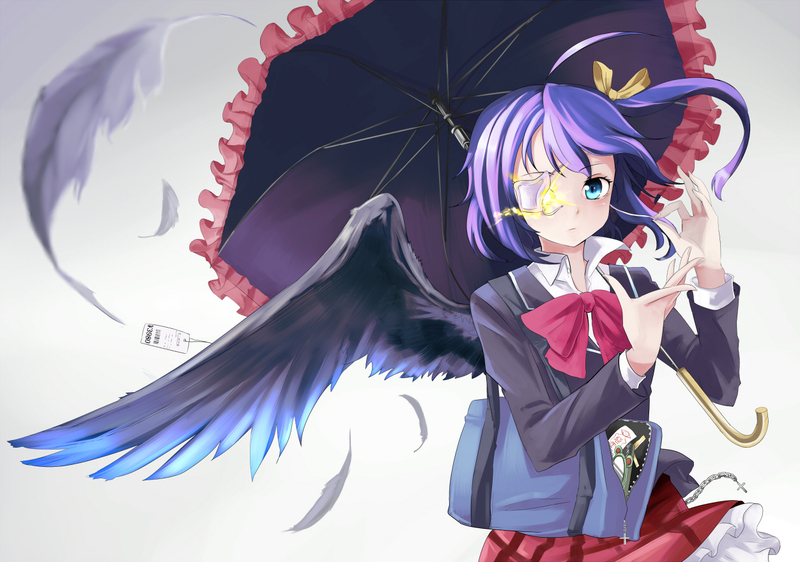 (which sadly is just some colored contacts) Unlike Yuuta however, she still has the chuunibyou. She is the girl who gets the most abuse but also the one that brings out the most laughter with her absurd yet comedic stances throughout the series. Take for example..that random scene when she bounces around like crazy during the pilot episode or those Lelouch-like poses. Yuuta "Dark Flame Master" Togashi – he USED to have the chuunibyou syndrome. 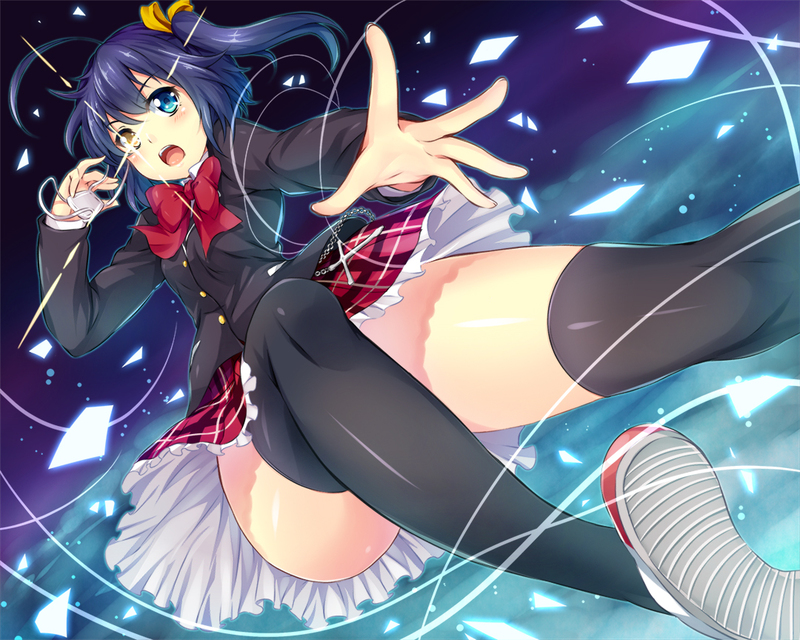 But now, it seems that his past is haunting him once again when he meets Rikka. He used to believe himself to be..the Dark Flame Master. I'm trying to envision myself exactly what is the Dark Flame Master. Does it have flames? Is it a master of the underworld? Or is just some villian who can emit cool flames. 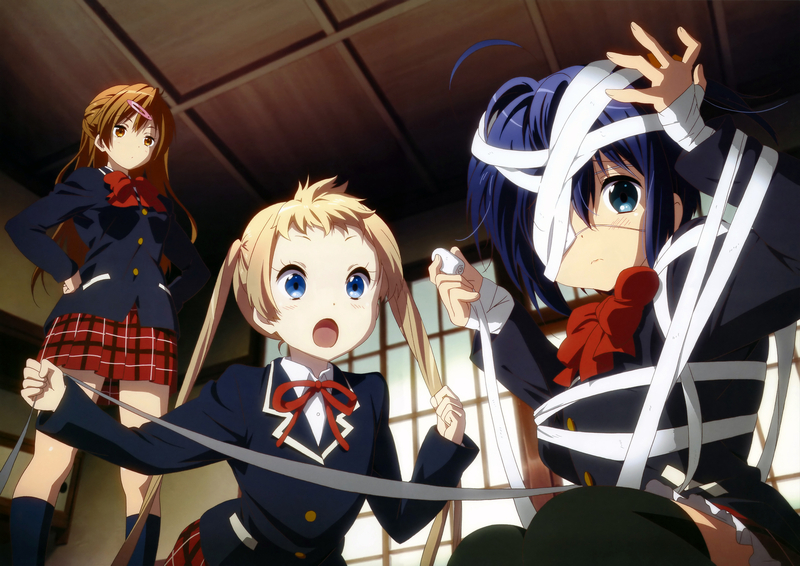 At any rate, his high school years becomes abnormal after meeting Rikka. There's not too much of a story to be honest yet. The series is more about comedy and the events that surrounds the main characters. They live their high school days like normal teens although the majority are anything but normal. For example, Sanae and Rinka has this Tiger and Dragon rivalry. They fight in absurd ways that is beyond normal by the way they delude themselves. Yes you got it, they also have the chuunibyou as well, or at least used to. Later on though, the series takes some more emotional turns with a few insights into the past, especially those into our main female protagonist, Rikka-chan. The artwork of the series is glorious like most of Kyoto Animation's other works. Its background settings of rich visuals are there and reflected upon every delusion, every action, every laughter, every chuunibyou-like behavior. 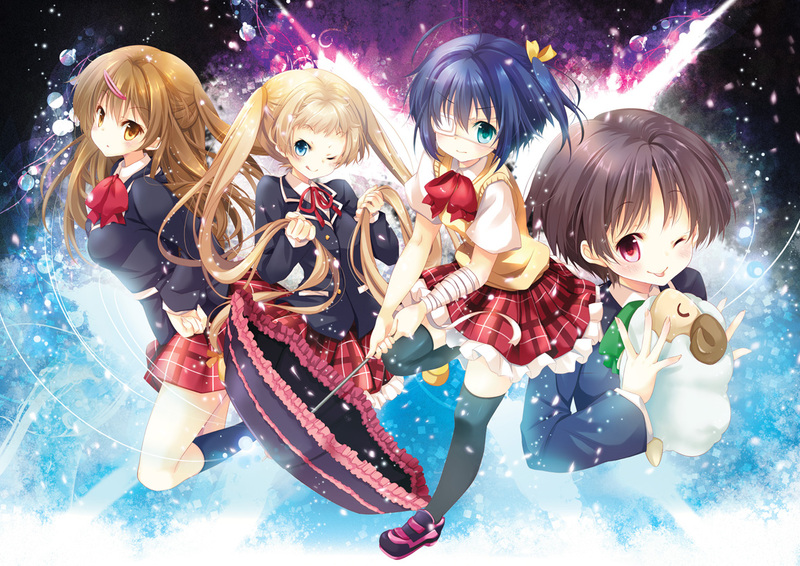 Kazumi Ikeda who is involved with the character designs of the series brings out the M in moe from the characters like Rikka, Yumeha Togashi (Yuuta's cute little sister), and Kumin Tsuyuri. The soundtrack is also quite lighthearted that reflects upon the comedic mood of settings and characters. When there are battle scenes though, it swiftly changes to a more fast paced rythym to make it looks like it's real despite the fact that it's just a delusion. Now as for the OP song..wow, just wow. "Sparkling Daydream" by ZAQ sure got their point through. The opening song of the series induces eye seizures. Every time I watch it (even upon now occasionally), the scenes flashes back into your head and makes your eyeballs follow them endlessly. 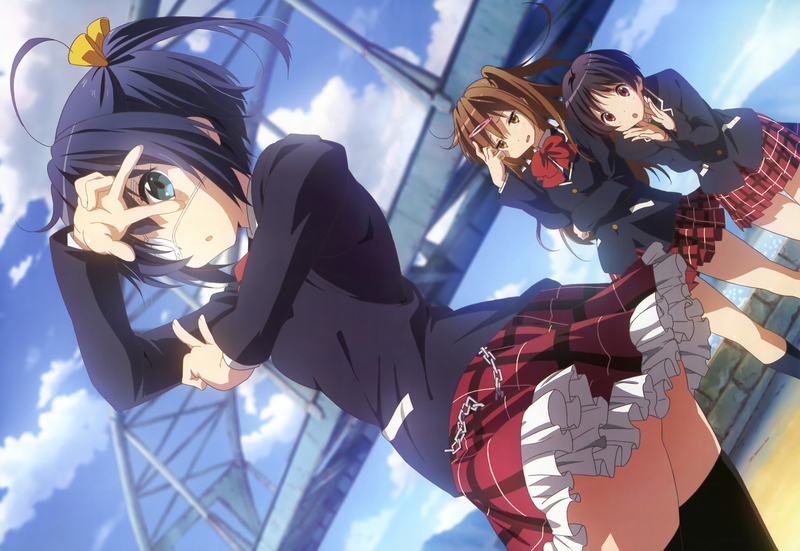 Of which, the OP song is also catchy with the silly pose of Rikka-chan. The stance of “(σ O ω・) σ←↖↑↗→↘↓↙←↖↑↗→↘↓↙←↖↑↗→↘↓↙←↖↑↗→↘↓↙← “ is ridiculously catchy and there have been many parodies on the net to mimic it. On the other hand, the ED song "INSIDE IDENTITY" by Black Raison d'être seems ordinary with a nice melody. Ultimately, Chuunibyou demo Koi ga Shitai! is a very entertaining series to watch. It's not like the usual harem with a pathetic protagonist who can't make up his damn mind. But rather, it involves a kid who tried to escape from his past but ends up living it now with his new friends at high school. Entertainment is not so easy to bring these days especially with a lot of already used ideas but this one here is executed pretty well in my opinion. So, give it a shot.